Missy – Facts or Fiction? 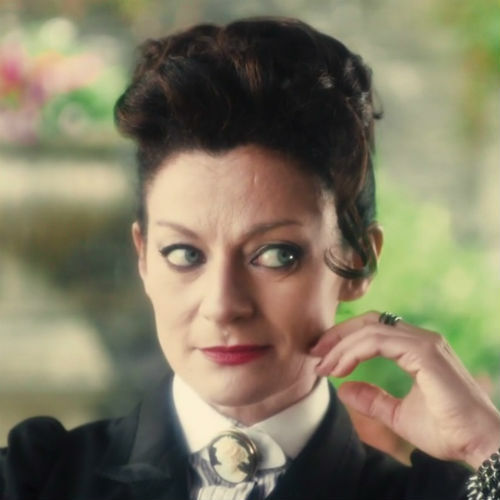 I have mentioned it before – Moffat has piqued my interest with the introduction of the character Missy (played by Michelle Gomez). She appeared at the end of the first episode and close to the end of the second, her appearances fleeting and curious as with Madame Kovarian (Frances Barber) in Series 6. For my part, I appreciate these glimpse – I have a soft spot for Michelle Gomez as an actress. Not sure why. I was never a big fan of The Green Wing, but when I did watch it was probably to see her, Tamsin Greig, and the talented Mark Heap. Anyway. I have seen various theories about Missy. Is she a renegade time lord? Would Moffat regenerate The Rani, as RTD regenerated The Master? Or, might she be River Song, who also has the regeneration-thing going on and the rightful inclination to refer to The Doctor as her ‘boyfriend’ (though, that might be a hint it isn’t River, as surely she’d refer to him as her husband, or more probably just ‘Sweetie’). When we first saw her, I was taken by an overwhelming sense of familiarity with the setting for her ‘afterlife’, which seemed very much akin to the virtual afterlife River appeared in at the end of ‘Forest of the Dead‘. It could easily be they simply just used the same location or similar lighting – but, that familiarity and the reference to ‘boyfriend’ did scream River. Thoughts of the planet-sized Library also slammed home with the last episode, ‘Robot of Sherwood‘. While The Independent seemed to be unimpressed with the story – which catered towards kids and caricature more than darkness and plot thrusts – I think I saw something different. Rather than an episode focussed too much on some inane quest by The Doctor to prove the fictional nature of Hood, why not consider this as more a matter of fictional leakage. Think Library, with a capital ‘L’, here. The Library contained an immense amount of knowledge, including fiction, and the Moon set to maintain the integrity and security of the Library used fictionalised environs to contain viruses infecting the planet. Why not have a ‘world’ within the Library where Robin Hood exists? The Mark Gatiss penned episode also contained a lot of in-references to previous Doctors. The Doctor questioned whether they’d landed in a Miniscope – from the 3rd Doctor episode ‘Carnival of Monsters’, the Sheriff had his chance while King Richard engaged in the Crusades – assisted by the 1st Doctor, and The Doctor battled Robin with a spoon – quite possibly a reference to the 8th Doctor’s fascination with said item of cutlery. Again… might leakage of knowledge from the Library have something to do with this? What of the connection between Missy and The Promised Land? Are the virtual environs of the Library – filled with the knowledge and personalities of myriad people and civilisations – that place? Why would anyone seek to go there, aside from the potential for immortality – or a source of lost souls to facilitate some darker aim? I suppose only time (pardon the pun) will tell. This entry was posted in Current Doctor, Speculation and tagged Frances Barber, Green Wing, Michelle Gomez, Missy, Moffat on September 10, 2014 by Paul B.